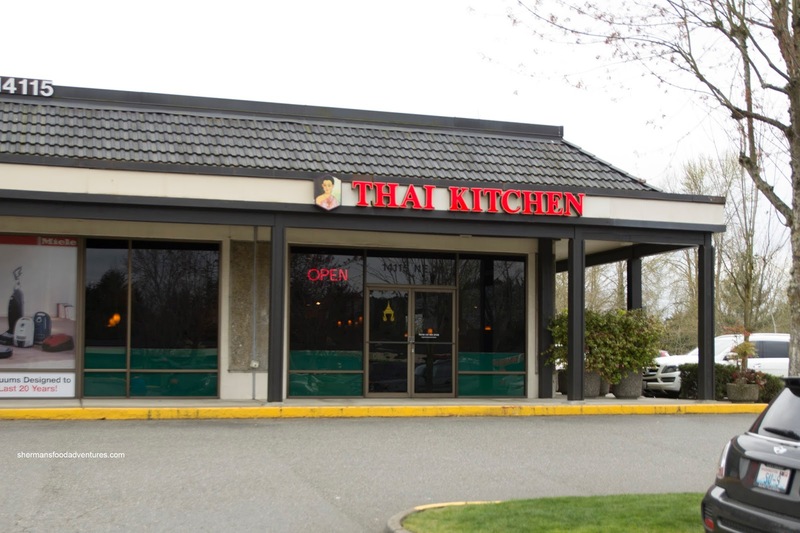 When I suggested we meet up with Goose for dinner while we were in Bellevue, he suggested Thai Kitchen just down the road from his house. 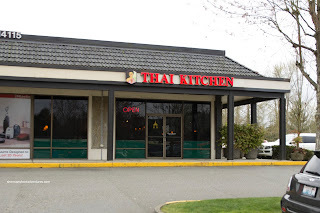 I was a little concerned as Thai food can be hit and miss with the kiddies. It turned out that our kids had no issue with the items we ordered for them, but for Goose's kiddos, well, let's just say his daughter made plain rice her meal... Maybe we give my son too hard of a time about his picky ways... There seems to be a boatload of other kids that don't have much variety in their diet. 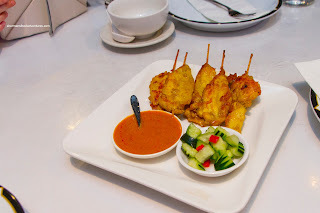 Well, all the kiddies except for the aforementioned daughter, dug into the Chicken Satay without much issue. These large skewers of meat featured chicken breast that was fairly well-seared and seasoned (with a curry-like flavor). The meat wasn't succulent per se, but it wasn't overly dry either. The accompanying peanut dip was pretty sweet with only a slight aromaticness. After that, we had planned on the all of the kiddies sharing the Pad See Ew. 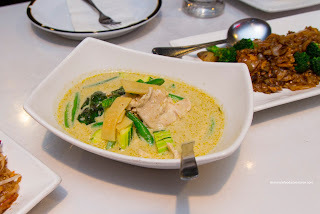 Yup, Goose's daugther turned her head in disgust at the sight of the noodles. Well, I personally didn't mind them as there was considerable wok heat to go with the already aggressive use of palm sugar. I found the noodles to be a bit clumpy as they were soft, but there was actually more chicken to be found. I did enjoy the crunchy broccoli as it added a nice crunch. 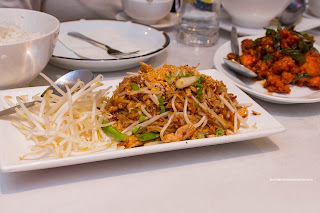 There were 2 choices of Pad Thai on the menu and we had no doubts about which one - The Traditional Pad Thai, as they stated it was made with tamarind (rather than a substitute for the other version). Interestingly, I didn't find it tart enough for my tastes, yet it was still decent. Once again, it was sweet, with nice hits of crunch and zing from the pickled turnip. The noodles themselves were chewy albeit a touch clumpy. We asked for medium spicy and it was of course a bit mild, but still had a slight kick. At first, I wasn't holding out much hope for the Bangkok Chicken as it sounded like a sweet n' sour affair. Instead, it featured flavours that were sweet, yet kicked up a notch with spicy and savoriness. Furthermore, the pieces of white meat were slightly crispy while not overly dry in the middle. 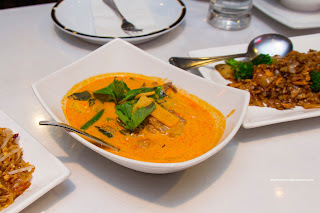 For our curries, we had both the Chicken Green Curry and Beef Red Curry. Since we asked for medium, the spice level wasn't able to balance off the sweetness in both curries. That would be somewhat our fault for asking for medium. As such, the green curry wasn't able to exhibit enough shrimpiness and spice to counteract the palm sugar. With that being said, the creaminess from the coconut milk was appealing. Furthermore, it was interesting to see the exclusion of eggplant and bell pepper (replaced by green bean and cucumber). As for the red curry, it was a bit more savory than sweet, yet still suffered from the same affliction. Once again, this version did not have any bell peppers. 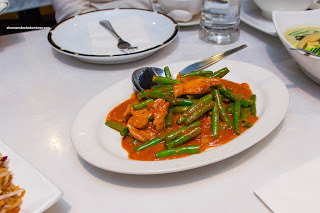 Lastly, we had the Pik Khing (green beans with pork, red chili paste, garlic, onions, oyster sauce and peanut sauce) that was also very sweet. The beans were still crunchy though while the pork was kissed by a hot work as there was a nice sear. 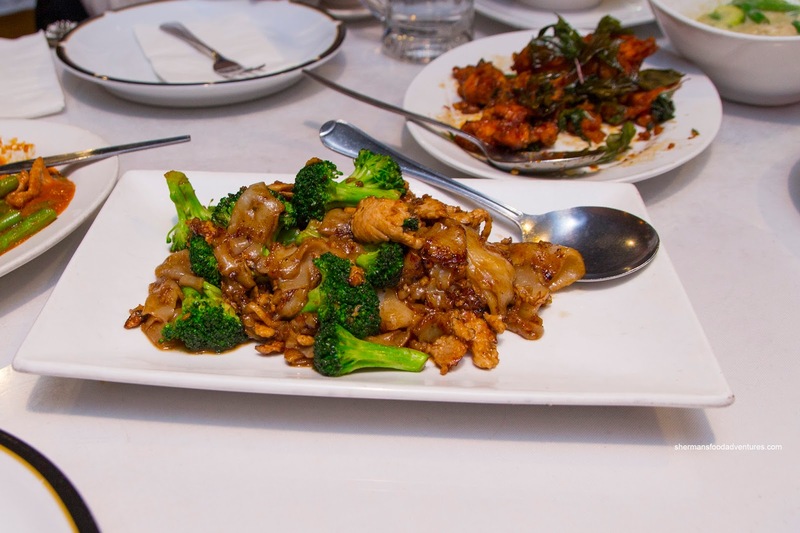 I found that eating this dish was rice worked quite well due to the strong flavours. Overall, the food did not leave us wanting in terms of impact. 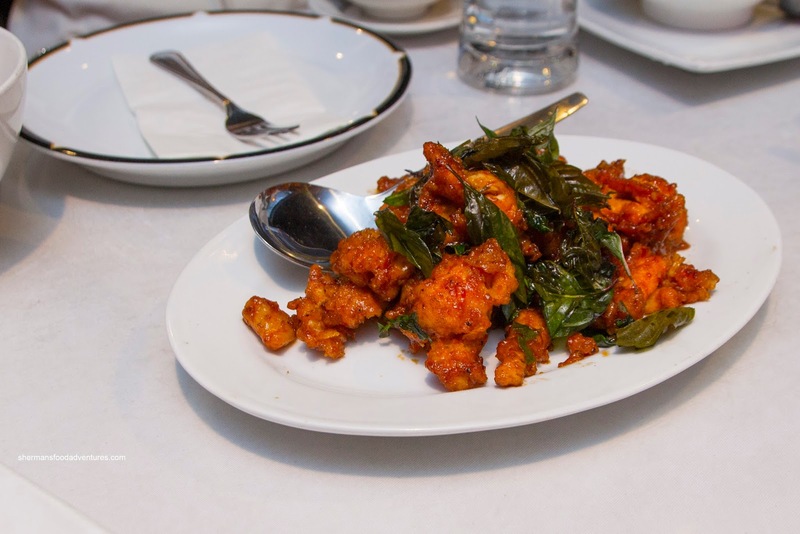 The dishes were on the sweeter side, but that may have been due to us choosing less spiciness. Service was solid and the prices were quite reasonable.